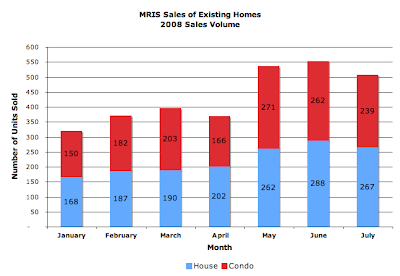 MRIS has released its data for signed sales contracts for existing home sales in July 2008. 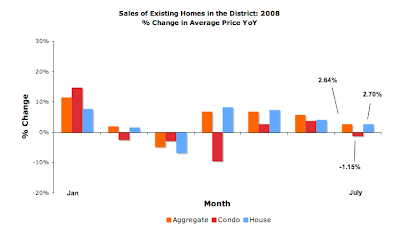 Compared to July 2007, fewer units sold, there was lower dollar volume, and average prices for single family homes were higher while those for condos fell. Forty three of the units sold, 8.5%, were valued at more than $1MM [recall my earlier comments on the higher end skewing the numbers]. Units sold: 506, down 31.62%. Average sales price: $ 580,119, up 2.64%. Median sales price: $ 422,180, down 2.05%. The number of units going under contract in July compared to June fell 8.8% for condos and 0.73% for homes. Looking at the graph below, one could infer that the market peaked in June. 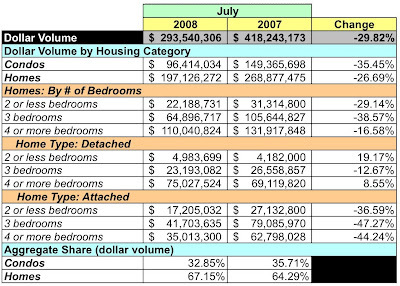 For almost every category of housing reported by MRIS, unit sales and dollar volume has fallen dramatically YoY. 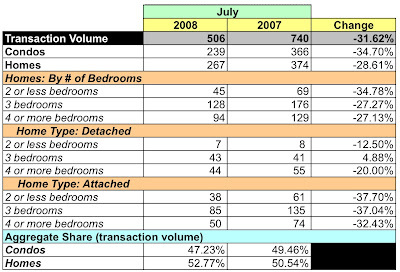 Condos are down 35.45% on dollar volume and 34.7% on unit volume. Homes down 26.69% on dollar volume and 28.61% on unit volume. Single family homes continue to grab about 2/3 of the dollar volume, but unit sales are almost evenly spilt between single family homes and condos. 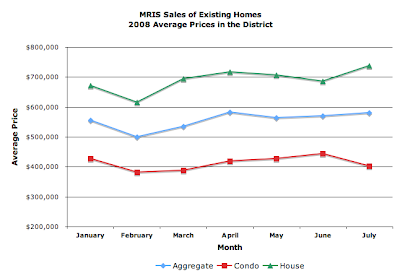 Compared to January 2008, the aggregate average price in the District has risen 4.24% [July compared to January]. Average prices for condos are down for the year [5.47%] while those for homes have risen 9.81%. 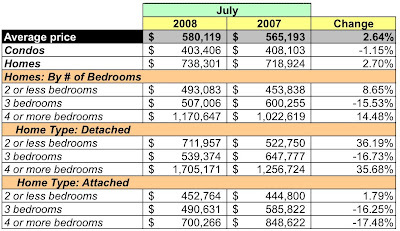 Based on July's sales volume, there's now 6.58 months of inventory for condos and 6.71 months for homes, increases of 5.98% and 1.84% from June 2008. But, compared to July 2007, the number of condos listed has risen 1.2% and for homes, 15.0%. Do you know if there has ever been such a glut in the past? I've heard of buyer's markets, but this is ridiculous! I have no idea. MRIS' reports for past years might shed some light.